Real wages declined with 25%. Youth unemployment is above 50%. The number of people applying for food aid is fast rising. Malnutrition among children is spreading, while hospitals are being closed. UN agencies and Doctors without Borders are talking about a humanitarian crisis. Is this a Sub-Saharan country? No, its Greece, a country that in the last few years was – and still is – mostly governed by Brussels and Washington. On March 28th we reported about the mini-civil war that broke out in a community in Greece where a Canadian company was going for gold by force. A Greek drama that included a mayor ‘taken hostage’ by some thousand angry civilians who had surrounded the town hall. But that incident is unlikely to remain a local issue or an isolated incident. A large part of North Greece is planned to be sold and transformed into gold mining pits, starting in Thrake, Halkidiki and Kilkis. Just above Kilkis, ca 50km North of Thessaloniki, another Canadian company (a Greek subsidiary of Eldorado) is trying to open a gold mine in a fertile traditionally agricultural area. The saga started on July 13th 2011, when the Greek Ministry for the Environment (YPEKA) sent a letter to the district government of Kilkis asking them to express their opinion on the leasing of two areas in the prefecture of Kilkis for the creation of copper-gold mines: the first on the mountain range of Kroussia (roughly 91 km2) and the second on mount Paiko (roughly 84 km2). The 91 km2 area of Kroussia contains 12 villages and mainly consists of farmed fields. Kilkis District and Kilkis Municipality rejected the idea, but that did not stop the national government from speeding up the process. First, the government tried to give some legitimacy to the project in October last year, through an internet vote that nobody in Kilkis knew about (not even the Municipalities involved). Besides not knowing, the villages’ inhabitants of these 12 villages are mostly old-aged and have absolutely no computer literacy. The so-called “vote” runned for roughly 30 days and ended up with only 20 votes. Some votes were coming from people unknown in the area and some from geologists involved in the project. On January 4th 2012, the Ministry for the Environment announces an open international bidding for the leasing of the area on the mountain range of Kroussia (where Kilkis is located) for the purpose of installing copper – gold mines..The area to be leased also contains the drainage basin of Galikos River from which the city of Kilkis, many smaller towns and villages, plus a part of the city of Thessaloniki get their drinking water. When this news came out, some people started to spread awareness about the consequences of gold mining, which quickly led to a broad resistance movement. In total 5000 signatures were collected and 58 organizations spoke out to put their position against the mining project on paper and in public. 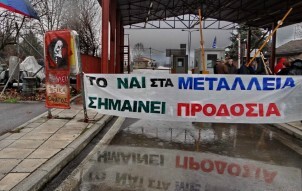 After all this pressure from local citizens, on February 6th and after many calls from the local representatives, officials from the Ministry for the Environment came to the city of Kilkis to try to convince the angry public about the advantages that gold and copper mining will offer to the area. But the public had seen the data and video’s about “gold-mining development” taking place in other parts of the world (Canada KI-land, Swedish Saami, Argentina, Turkey, Bulgaria, …). Despite the differences, a very important thing was said in this meeting: the ministry’s assurance that if the public – as expressed through their elected representatives – decided against the creation of the mines, the whole process would be stopped and the bidding would be canceled. On February 16th, the Ministry for the Environment invites the local representatives to a committee of the Greek Parliament to discuss all aspects of the copper-gold mines. The ministry’s under-secretary Mr Maniatis accuses everyone of having “phobic syndromes” when told that the municipal council and the public had already decided against the installation of the mines. When asked about the total absence of information or the non-existing consultation with the public, he pleaded lack of personnel and financial resources. But he insisted that somehow the process of informing the public would continue (in committees in Athens that local people could not participate) and that the public’s final decision would be respected. Contrary to his promise, no other actions on that direction were taken. Instead the bidding process went on as planned. When it became clear that the local communities were not going to accept the project, the government only proceeded to give information to the parliamentary committees and decided without the citizens. Finally, on March 14th, the government received the offers from two interested mining companies and the procedure of choosing the mining partner goes on as initially planed. When there’s gold, things like democracy have to step aside. The story of gold is the story of Greece today. The question all EU citizens should ask: if Greece has transformed from a democracy to a technocratic dictatorship that helps foreign companies to plunder the remaining resources at all cost: who is to blame for it? We have seen how EU leaders reacted after the Greek people voted on May 6. Only 33% of the Greeks voted for parties that implemented and backed the wave of privatizations and mining projects that were given as conditions from the EU and the IMF. Because the two parties that got 33% of the vote still took 49% of the seats and no government could be formed, Greeks will now have to vote again on June 17, but they can wonder: do we still have any choice? Even before the new election was announced, EU leaders were scrambling over each other to say that they did not actually plan to listen to what Greek people had to say about the austerity forced upon them. Instead, they are warning that if ther Greek people do not vote in a way they want them to vote, they will be kicked out of the euro and the EU. They make it appear that there is only one way to pay back the Greek debt and that is by more austerity, which is in effect leading to a humanitarian catastrophy not seen in Europe since the war in the Balkans. They have nothing to say about their own part of blame, neither are there any IMF or EU conditions to start taxing the biggest commercial fleet in the world, the Greek fleet. They simple do not allow Greek politician to make any political choices on where the money should come from – in effect leaving no space for democracy to work. Greek politicians do have ideas on how to re-organise their economy and society but they are not even allowed to speak out for them. The citizens of Kilkis resisting to gold mining have expressed many agricultural, farmer and production proposals that could bring money to the city of Kilkis and thus to the Greek state, but without sacrificing the environment and their quality of life. But these are not even considered by a puppet state that in practice is governed from Brussels and Washington. So the big question is what the EU will put first after the Greek people make their choice on June 17: its neo-liberal ideology or its democratic values? The answer will probably define the EU for years to come. I am citizen of kilkis, i have born in one of the 12 villages (…the 91 km2 area of Kroussia…) and part of the antimining-antigold group.